Sustain your infrastructure for maximum value. Like all infrastructure, green infrastructure requires monitoring and maintenance in order to function properly over the long term. Officials, professionals, and staff need training. And engaging the community creates a sense of ownership and stewardship. Maintenance varies for each type of green infrastructure practice and a specific maintenance plan should be tailored for each installation. Maintenance responsibilities, inspection frequency and costs should be evaluated during the design phase of each practice. In order to ensure the proper performance of the green infrastructure practice, maintenance plans should identify responsible parties over the lifetime of the practice and agreements should be put in place, as necessary, to ensure proper and regular maintenance. Here are basic principles for good maintenance, with specific guidance documents and manuals from NJDEP, Rutgers and other experts. Keep soil free of compaction. Control the occurrence of invasive species. Revegetate bare areas (with the exception of constructed wetlands and wet ponds). Provide easy access for inspection and routine maintenance. Conduct annual inspections of all structural components (inlet pipe, discharge outfalls, valves and related operational appurtenances). Clean out sediment traps and scour holes four times per year, and after all storms generating one inch or more of rainfall. Inspect underdrains of applicable GI BMPs twice per year to ensure they are operational. Inspect the planting bed at least twice per year for any evidence of pooling, bare vegetation and/or invasive species, to determine if the permeability of the bed has decreased. Mowing is normally conducted once per year, usually in the fall, using lightweight equipment such as string trimmers, to prevent the compaction of soil. Vegetation should not be cut any lower than six to eight inches above the ground. This avoids “scalping” the vegetation, leaves residual material that can filter pollutants even when the plants are not actively growing and helps maintain a seed stock. Provide at least 85 percent of the area in vegetative cover. If bare areas exceed 50 percent, the GI BMP should replanted with the same plants stipulated in the original design and construction plan. Inspect once a month and/or within 48 hours after a storm greater than 1.25 inches and note observations in a maintenance log to ensure proper actions are addressed should an issue arise during inspections. Offers extensive stormwater maintenance guidance that includes sample maintenance plans, field manuals, maintenance logs and inspection records. Provides a Sample Operations and Maintenance (O&M) Plan and Manual that incorporates rule requirements and additional items addressed in the NJ Stormwater BMP Manual. Provides specific guidance to Combined Sewer Overflow (CSO) permittees through Evaluating Green Infrastructure: A Combined Sewer Overflow Control Alternative for Long Term Control Plans. Chapter 4 addresses a wide variety of maintenance and planning issues. Developed this presentation, which provides green infrastructure maintenance guidance. Developed this Maintenance Manual, which provides excellent guidance to the department and partnering organizations, including developers and design professionals. Landscaping can be an integral part of a green infrastructure project, and Sustainable Jersey awards points for public plantings and maintenance with stormwater management in mind. The Green Grounds & Maintenance Policy must address the following topics: efficient landscape design; minimizing water consumption; recycled materials and composting; and integrated pest management. An overview of the GI BMP that provides a simple description of the BMP’s design. This can be supplemented with a simple schematic of the BMP or even a detailed as-built drawing. Clear and concise schedule of inspections (typically once quarterly and following any storm event that generates at least one inch of precipitation). Outline of the required/suggested maintenance equipment. The log book can be created in a digital format. This allows links to be provided to specific design features of the GI BMP and maintenance manuals, and to create and maintain a photographic record of the BMP condition and maintenance activities. The Connecticut Department of Energy and Environmental Protection has a simple but thorough maintenance checklist and form. This interactive e-learning tool from Rutgers Water Resources Program helps all New Jersey municipal officials ensure stormwater plans comply with New Jersey stormwater regulations. This e-learning tool, also developed by Rutgers Water Resources Program, provides an introduction to green infrastructure and highlights nine examples of GI. Through interactive activities, this tool helps explain how green infrastructure practices function. EPA’s Green Infrastructure Webcast Series is for public officials and practitioners beginning to implement green infrastructure, as well as for those who want to enhance established programs. NJDEP’s stormwater training page contains presentations, videos, and links to aid in the implementation of a stormwater management program and provides assistance in meeting permit requirements related to Municipal Separate Storm Sewer Systems (MS4s). Sustainable Business Network’s GSI Partners offers this three-day course designed to increase the knowledge of landscape contractors and land care managers as it relates to public and private GSI operations and maintenance. Students will leave this course with a basic understanding of the regulatory context of stormwater management, BMPs and their components, how to maintain the vegetation and above-ground components using adaptive and prescriptive management techniques, and how to diagnose and respond to safety and performance issues. This e-learning tool developed by Rutgers Water Resources Program provides an introduction into inventorying and mapping your stormwater infrastructure. It also reviews a case study that highlights the benefits of GIS-based databases as an alternative to paper records for municipal stormwater infrastructure systems. Community engagement and education is key to promoting the adoption of green infrastructure. Local community leaders and residents play an important role in identifying water resources problems, such as areas that flood regularly, where sewers back up, and where sediment or trash is washing into waterways. 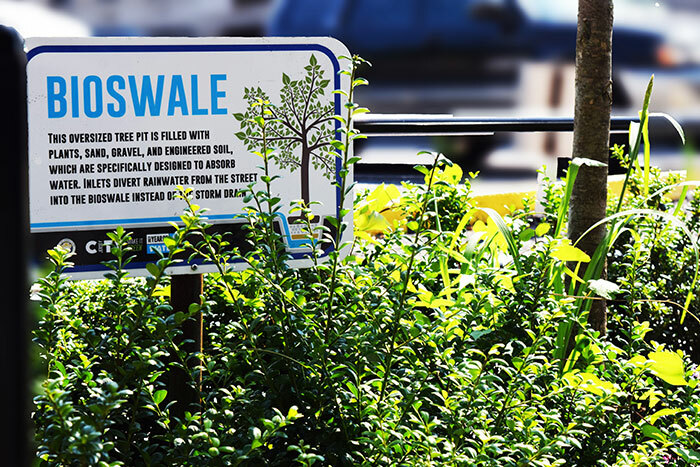 Once engaged and educated, community members can become advocates for green infrastructure and encourage the municipality, businesses, schools, and neighbors to install it. Communities can become engaged through the creation of local groups that focus on stormwater issues, such as municipal action teams. Specific programming can also be used to engage residents and provide incentives to install GI. Here are some examples of community engagement programs. In 2017, the Dr. Michael Conti School No. 5 broke ground on an innovative stormwater management project in partnership with the Jersey City Municipal Utilities Authority (JCMUA), the Rutgers Cooperative Extension Water Resources Program, Jersey City Board of Education, and Jersey City START (Stormwater Treatment and Resiliency Team). The project is, funded by the JCMUA through a New Jersey Environmental Infrastructure Trust low-interest loan. 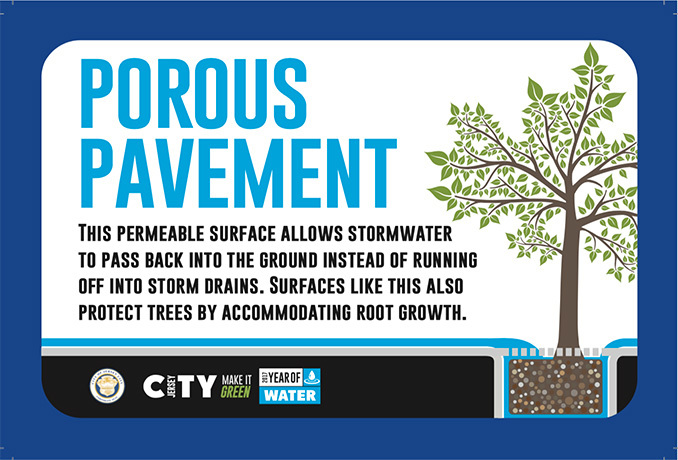 Downspout planter boxes, porous asphalt, and tree trenches provide storage for stormwater runoff, cleaning it and releasing it slowly into the sewer system to reduce localized flooding and combined sewer overflows. In addition, the downspout planter boxes provide ecological benefits, beautify the school, and provide an outdoor living lab for STEM education. At the Elysian Fields Community Garden behind Paterson Public School No. 5, the city transformed a once-vacant lot into a beautiful community garden. But the garden had no source of clean water for irrigation. In 2015, community members of Elysian Fields, the Paterson Public School No. 5, the Passaic Valley Sewerage Commission, and the Rutgers Cooperative Extension Water Resources Program partnered to install a rainwater harvesting system that provides access to water to the 37 families gardening in Elysian Fields. Passaic Valley Sewerage Commission funded the installation of a 2,500-gallon cistern and a pump to ensure the water reaches the garden. The unique partnership between Elysian Fields Community Garden and the private property owner made possible the rainwater harvesting system as well as the electrical connection that powers the pump. Adopt-a-Catch Basin programs beautify neighborhoods, reduce localized flooding, and help stop litter and debris from entering local waterways by encouraging residents to take care of a catch basin. Jersey City and Newark both have programs. The Essex County Environmental Commission launched a bin and barrel garden sale to promote home composting, reduce waste, and capture rainwater to irrigate home gardens. The program offered The Earth Machine home compost bins at a discounted price of $50 (retail value $100) and 55-gallon rain barrels for $65. Rain barrel giveaway programs are great opportunities to engage and educate residents about water conservation and stormwater management. Municipal staff can provide property owners with a rain barrel for free or at a reduced cost. Contact the Rutgers Cooperative Extension Water Resources Program to learn how to sponsor a rain barrel giveaway in your community. 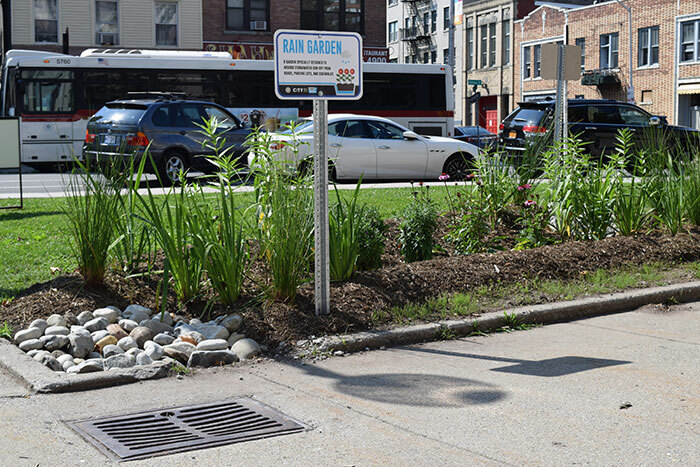 The Rutgers Cooperative Extension Water Resources Program partnered with the New Jersey Water Supply Authority Watershed Protection Program to offer rebates to homeowners who build rain gardens. Contact the Rutgers Cooperative Extension Water Resources Program to learn how to sponsor a rain garden rebate program in your town. 2017 was a ‘Year of Water’ for Jersey City. The initiative included a variety of events and programming designed to raise awareness around water infrastructure and conservation within the Jersey City community. The Interactive Yard is a tool designed to help you convert a yard from a lawn-dominated landscape into one that features beds with “Jersey-friendly” plants. As you transform the yard, you will remove high-maintenance lawn areas and reduce the need for fertilizers, add beds with native plants, reduce stormwater runoff and create habitat for wildlife and pollinators. GIWiz offers you access to a repository of EPA-sourced green infrastructure tools and resources designed to support and promote sustainable water management and community planning decisions. The tools and resources available through GIWiz will help you analyze problems, understand management options, calculate design parameters, analyze costs and benefits, evaluate tradeoffs, engage stakeholders, and/or develop education and outreach campaigns. Take an active role in recycling rainwater – install a rain barrel at your house! Rain barrels collect about 50 gallons of water that can be used to water your lawn and plants. 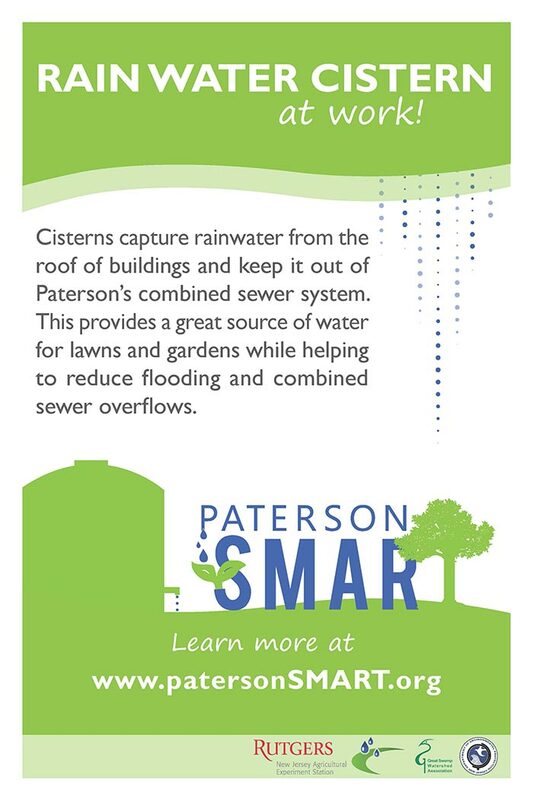 Harvesting rainwater has conserves water, prevents runoff pollution, saves money on water bills and can help prevent basement flooding. The goal of the Rain Barrel Train the Trainer program provides residents with tools to teach their communities how to build and install rain barrels. Program participants are provided with the Rainwater Harvesting with Rain Barrels Trainer Manual. This smartphone app is designed to help users install a rain garden properly at home, office, or job site. Through video tutorials, diagrams, text, and tools, the app conveys how to determine the size and placement of a rain garden, evaluate soil type, measure the size of the drainage area, select plants, and install and maintain a rain garden. This manual provides a step-by-step procedure to create a beautiful and sustainable rain garden landscape. The Rain Garden Outreach Manual equips volunteers such as master gardeners, environmental stewards, master naturalists and community environmental groups with the materials needed to deliver community-level outreach. River-Friendly Certification Programs work one-on-one with residents, businesses, golf courses and schools to reduce pollution, conserve water, restore habitat for wildlife and educate the public about becoming better environmental stewards. The eLearning tool provides an introduction to green infrastructure and highlights nine examples of green infrastructure practices. Through interactive activities, this tool explains how green infrastructure practices function. Rain barrels are a great tool for promoting water conservation and the reduction of stormwater runoff in a community. This manual is designed to assist educators, municipalities, garden clubs, Cooperative Extension Master Gardeners, and environmental organizations in teaching others about the environmental benefits of rain barrels. 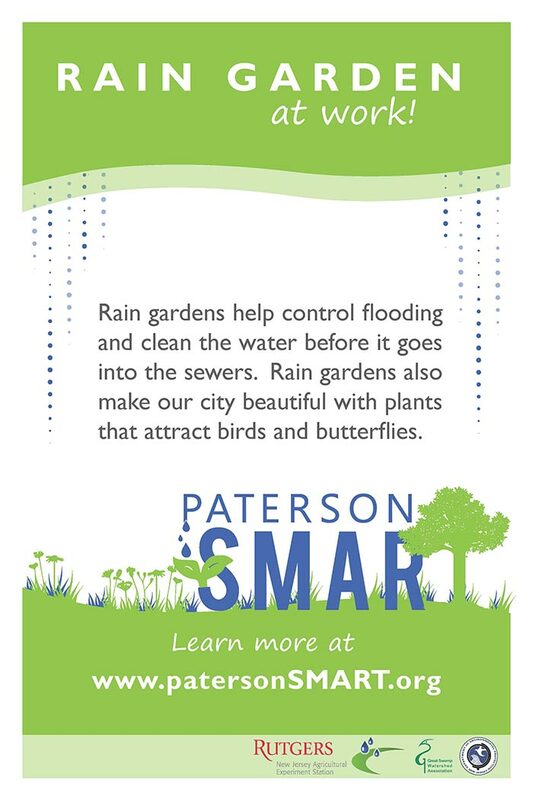 Rutgers Cooperative Extension’s Stormwater Management in Your Backyard program empowers volunteers to educate their communities about the benefits of rain gardens. The program includes a Rain Garden Outreach Manual to provide volunteers, such as Master Gardeners, Environmental Stewards, Master Naturalists, municipal environmental commissions and community environmental groups with the materials needed to provide community-level outreach. Within the Next Generation Science Standards (NGSS), there are three distinct and equally important dimensions to learning science. The three dimensions include crosscutting concepts, science and engineering practices, and disciplinary core ideas. Science and Engineering Practices describe what scientists do to investigate the natural world and what engineers do to design and build systems. Students engage in practices to build, deepen, and apply their knowledge of core ideas and crosscutting concepts. The Wallkill River Watershed Management Group organized a week-long stormwater day camp for 2nd- to 7th-grade students at the McKeown Elementary School in Hampton. Through hands-on activities, games and demonstrations, the students learned how to prevent “people pollution” from entering local rivers and streams, how to conserve water by constructing rain barrels, how to design a rain garden to capture rooftop rainwater, and how to install native plants in one’s yard to collect stormwater runoff, allowing the water to soak into the ground instead of flowing over the land and collecting pollutants before entering the storm drains. The award-winning, Project WET Curriculum and Activity Guide 2.0 gives educators of children from Pre-K and kindergarten to 12th grade the tools they need to integrate water education into every school subject. Through a “Do, Reflect, and Apply” approach, Rain to Drain—Slow the Flow curriculum enables students to master the science of how water moves and help to design a community where water moves into the ground, becoming a helpful resource instead of a source of pollution and flooding. The Fairmount Water Works’ Understanding the Urban Watershed curriculum provides engaging lessons and activities, materials, rubrics and resources designed for the middle-school student to explore stormwater management. With a quick log-in option, it also offers formal and informal educators access to join an online discussion forum for sharing ideas, successes, and challenges. This program provides educational lectures, hands-on activities, and community-level outreach for students on the topics of water quality issues and stormwater management practices such as rain gardens and rain barrels. The program aims to provide students with an opportunity to apply their science, math, and communication skills to real-world environmental problems. 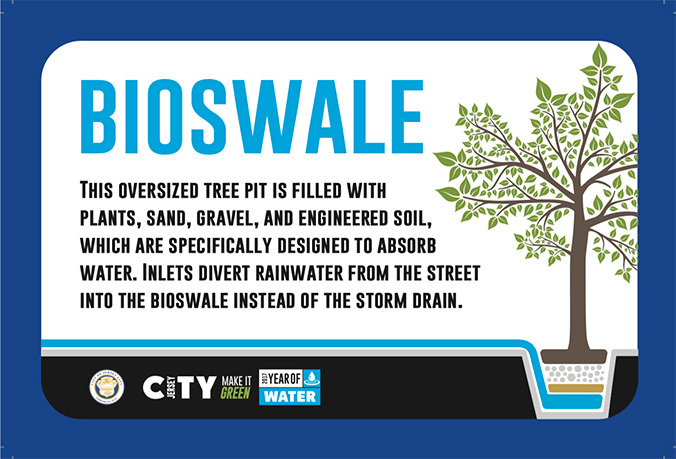 Through the two lessons in this unit, students are introduced to green infrastructure and low-impact development technologies and take on the role of stormwater engineers through five associated activities. The unit prepares the students and teachers to design and install green infrastructure projects to manage stormwater at their school campuses, homes and communities. The Watershed offers educator workshops and resources throughout the year at the Watershed Reserve. These workshops empower teachers, scout leaders, and home-school parents by increasing their understanding of the local natural environment through hands-on, inquiry-based activities that instill a sense of stewardship. Workshop facilitators are Watershed staff, state-certified to provide professional development. Be Water Wise engages students in water-related activities such as math, science, geography and language skills. Students also create projects at their schools to help conserve water and reduce stormwater runoff, and present their projects to city officials. The EnviroScape® series of portable models demonstrates water pollution concepts and prevention solutions. The models and kits can be integrated easily into any STEM education program — they are engaging and effective, as they create a real sense of understanding through experience and hands-on demonstration. Environmental education models make complex issues seem simple, helping people prevent water pollution in their communities. The Sewer in a Suitcase is a model of a city sewer and water treatment system that was created to explore these and other questions about combined sewer systems The model and guide will help you lead your students through the ins and outs of the real system, using the pieces contained in the Sewer in the Suitcase. All you need to do is add water! Celebrate water and learn more about your local watershed. Sponsor a Make A Splash Festival with a Project WET! Water Festival Grant. Festivals are held on weekdays during spring (May and June) and fall (September and October). The celebrations are designed to engage students in hands-on water lessons and investigations. It is the goal of Project WET to promote an awareness of and respect for water resources through a non-biased approach. Use Earth Day or Earth Week as an opportunity to promote clean water using green infrastructure. Through tweets or posts with “fun facts” and “did you know?” information, educate the public about how soils clean water through infiltration, replenishing groundwater and aquifers, and helping make lakes and rivers safe for swimming and fishing. Engineers Week aims to help kids and adults discover engineering by celebrating engineering professions, discover engineering with hands-on activities, videos, and connecting with local colleges and universities. Environmental Education Week is an invitation by the National Environmental Education Foundation to explore your connections to the environment, showcase how individuals and organizations are leveraging these insights to make a difference on behalf of the environment, and share stories to help others to join the charge. Imagine a Day Without Water is an annual day to raise awareness and educate America about the value of water. Message framework, logos, resolution templates, press releases, and blogs/op-ed templates are provided by the Value of Water Campaign, along with other materials that can be used on social media platforms. Infrastructure Week is a national week of events, media coverage, and education and advocacy efforts to elevate infrastructure as a critical issue affecting all Americans. Find out how you can take action using the new shareable social media graphics and pre-written tweets.